About Pastor John W. Woodall, Jr.
John W. Woodall, Jr. was born on October 22, 1963. He is the eldest child of Dr. John W. Woodall, Sr. and Janet Woodall. In 1972 at the age of eight Woodall expressed a hope and heartfelt belief that Jesus, the Christ, died for his sins, was buried and rose from the dead. He was baptized at Friendship Missionary Baptist Church, in Anderson, Indiana. Pastor Woodall has had an unconventional and untraditional path to the pastorate. He earned his Bachelor of Science in 1986 at Ball State University. In 1987 he received his Masters of Business Administration degree at the Ball State University Graduate School of Business. He then earned his Doctor of Jurisprudence degree in 1990 at Indiana University School of Law in Indianapolis. He met his wife-to-be, Karen Edwards at Ball State University in 1983 and they were married in 1987. She has been and continues to be, his best friend. They have three children John III (and Daughter-in-Law Ramica), Jordan and Janelle. He also has one beautiful granddaughter Journee. 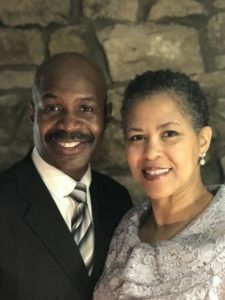 Under the calling, teaching, and direction of Pastor Charles Walters of the St. Paul Missionary Baptist Church in Indianapolis, Indiana, he served as a deacon-in-training and was ordained as a deacon in 1995. He accepted his calling to the ministry of preaching at Nazarene Missionary Baptist Church under the leadership of Pastor James C. Williamson in April of 2002 and he preached his first sermon and obtained his license in May 2002. However, between 2002 and 2010, he was educated and trained to be a minister, preacher, and servant under the leadership and instruction of Dr. Troy E. Ladd of Little Bethel Missionary Baptist Church. Pastor Woodall credits Dr. Ladd with having instilled in him a framework from which to do God’s work as a man, as a disciple, as a minister, and as a pastor. Under Dr. Ladd, he served as a Youth Minister, taught practical preaching classes and led the marriage enhancement ministry. Dr. Ladd saw fit to ordain Pastor Woodall in 2007. Pastor Woodall was called to be the pastor of South Calvary Missionary Baptist Church on April 23, 2010. He has loved every moment and describes the people of South Calvary as being “beautiful people who are easy to love”.